A’dam Good Stay – Guesthouse Adamgoodstay guesthouse and cultural exhange in Amsterdam centre....book direct for best rate! AdamGoodStay guest house & cultural exchange for a safe, affordable and convenient stay in the centre of Amsterdam. Adamgoodstay guesthouse / homestay is located in the city centre, where you can enjoy being part of daily life in one of Europe’s most relaxed but exciting places. AdamGoodStay guesthouse offers a luxurious guest-room, where guests feel ‘at home away from home’. Where else do you find so many places of interest, cultures living together, famous museums, cosy pubs and fun shops, fine restaurants, (flower) markets and design. Once you’ve closed the door you’re right in the middle of this buzzing city – feel the spirit! – Close to Leidseplein and Kerkstraat. 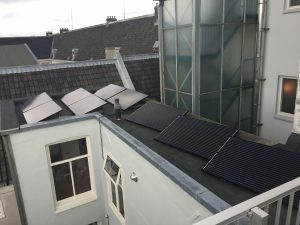 – Two minutes from Reguliersdwarsstraat. – Close to Paradiso, Melkweg, Jimmy Woo, Sugar Factory; name it! Adamgoodstay has made an investment in green energy: a non-polluting source of power. First In January 2008 we installed a serie of solar-panels on the roof of our house. The summer of 2016 we upgraded with 9 brand-new sun soaking solar panels. This means that electricity in your room is environmentally sound. Together we can make it happen! Want to request a booking or have any questions? Please send us an email!